Post in this forum to say hello and talk to our members! This is for any talk about, well anything. Have something to say. Post it here! Anything happening in the outdoor world? Post and chat here. All sports talk goes here. Have some fun with it! Anything funny enough to laugh about? Post it here so we can all see! Here you can share, play, or talk about any games or game systems! If you have a secret recipe you want to share with our members. For any animal or fish for that matter. Post it here! 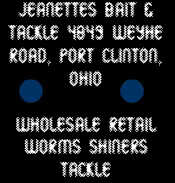 Post here about your fishing reports in northwest Ohio. Post here about your fishing reports in southwest Ohio. Post here about your fishing reports in Central Ohio. Post here about your fishing reports in northeast Ohio. Post here about your fishing reports in southeast Ohio. From Sandusky west. Here's your forum for western basin fishing reports. From Sandusky east. Here's your forum for central basin fishing reports. For Ohio's biggest river. This forum is for all who fish it! Post here about your fishing reports in any out of state area. This forum will always have updated weekly fishing reports for lakes across the state, big ole' Erie, and the Ohio River. This is for any hard-water discussions. Maybe want to share some ice stories? Post a topic here! This forum is for any fly-fishing info or reports. Any bow fishers out there? Post here to chat about bow fishing! If you have any questions on your tackle. Our members may be able to help. This forum is for all boat & motor talk. Also check out the sub forum of yaks and canoes. A forum for any type of bass fishing from whitebass to smallmouth to bucketmouths. Have a question or comment? Post it here! Have a question for those whiskery fish? If you do post here to see if our members have the answer! Have a question or comment about any panfish ranging from perch to crappie? Post it here! This forum is dedicated to pike and muskie discussions and questions. A forum for all trout discussion. Have fun with it! This forum is dedicated to walleye saugeye and even sauger. Need to know something about them? Post it here and ask our members! Here we can all chat about any hunting stuff and have some fun with maybe want to share some shed antler pics or even an old deer camp story! Also check out the sub forums of Canine Discussion Guns and Ammunition and Morel Hunting! This Forum is for all types of deer hunting. To also use the sub forums for specific types of deer hunting. This forum can range from upland bird hunting to turkey hunting and to duck & goose hunting. Check the sub forums for more specific areas to post. This forum has a variety of sub forums including rabbit hunting, squirrel hunting, varmit hunting, and coyote hunting! Want to go on a trip? Maybe want to know where the best place to camp is? Comment here with any questions. Found another great site. Post it here so we all can visit. One rule here is you must have a minimum of 5 posts before posting.